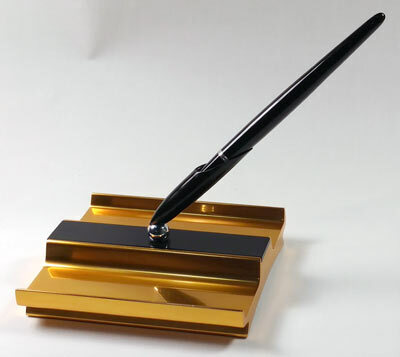 13438: Edward Todd lever-filler set in box: rare and elegant, solid 14K gold with black enamel trim, 12.4 cm long, #3 nib has a semistub tip, matching pencil uses 1.1 mm lead, both pieces neatly monogrammed "S.W.M.". 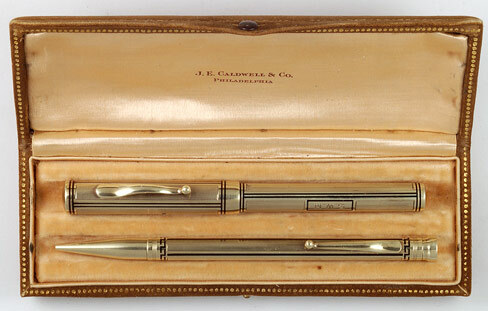 Leather-covered box bears the name of the retailer, famed jeweler Caldwell & Co. of Philadelphia. 11323: Parker Duofold Senior: striking streamline button-filler in copper pearl -- not a catalogued color, with only a handful of examples known; 13 cm long, gold filled trim, full USA imprint, excellent color, some plating wear to the lower cap band. A notable Parker rarity. 13450: Parker 51: rare pre-launch model in black with 1/10 14K gold filled cap in grouped parallel lines with monogrammed (CKB) cartouche, very early four-hole clutch; Blue Diamond clip, two-tone clutch ring, metal jewels appear to be silver, blind cap imprint is bold and lacks date code, aluminum Speedline filler has one ding on its side, shell has some tool marks (see details), condition of pen is otherwise excellent. 12984: Parker 51 Demi Princess: extremely rare gold filled Aerometric filler, 12.5 cm long, with faceted "jewels" set into the ends and around the upper cap; shallow bumps to side of cap, otherwise excellent. 9687: Waterman 12: English-market black hard rubber half-overlay eyedropper-filler, 13.2 cm long, 9K solid gold barrel overlay, London-hallmarked with Waterman factory maker's mark; pattern is a combination of twist and deeply hand-chased floral scrollwork -- uncatalogued, and hitherto unknown. Barrel cartouche is monogrammed, gold has been polished down, so that the date letter cannot be read..
13162: Waterman 552V LEC: rare and uncatalogued black hard rubber lever-filler with smooth solid 18K gold USA factory overlay, 11.15 cm long. 18K marks on cap, barrel, clip, lever, and nib; no French hallmarks, but tiny Jules Fagard stamp is on heel of nib and back of lever end. 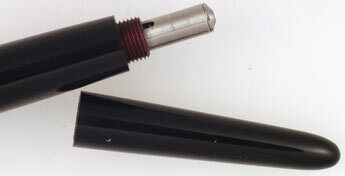 Pinprick marks to cap, bumps and polishing wear to milling at end of barrel. Barrel end bears no number, cap is longer than usual for a "V" size pen. The only example of its kind known to date. 12900: Waterman 20: giant black chased hard rubber eyedropper-filler, 16 cm long, nickel plated trim, largest Waterman of its kind, huge #10 nib writes an elegant line. Crisp imprints and chasing, slight and even fading (has not been reblackened or otherwise treated), pen appears never to have been filled, though it had been dipped; minor handling marks.